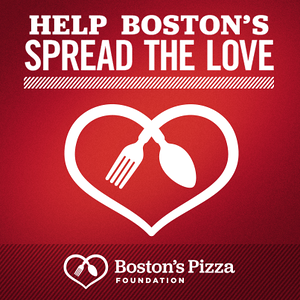 For every pizza you enjoy between Feb 3 - 23*, the Boston's Pizza Foundation will donate $1 to No Kid Hungry�. 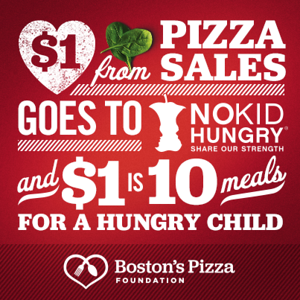 $1 provides 10 meals for hungry kids. 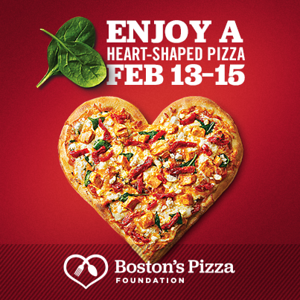 Enjoy a Heart-Shaped Pizza from Feb 13 - 15*. Did you know we now offer catering? It's the perfect solution for office lunches, birthdays, and more. Don't forget about Tuesday Service Industry Night! Come in and get 50% OFF EVERYTHING from 10pm to close.